Aging water infrastructure has become a reality for many utilities, bringing additional challenges to those already facing water loss issues, scarce funding, an aging workforce and more. In other industries, "smart" Internet of Things (IoT) technologies are being utilized to streamline processes and increase efficiencies with great success. Such technologies are now becoming available for water utilities. Smart utilities manage their assets through the use of automated devices that enable the collection and analysis of data on usage, flow rates, conditions and more. This enables them to take intelligent action that can reduce costs and ultimately deliver the best service to their customers. 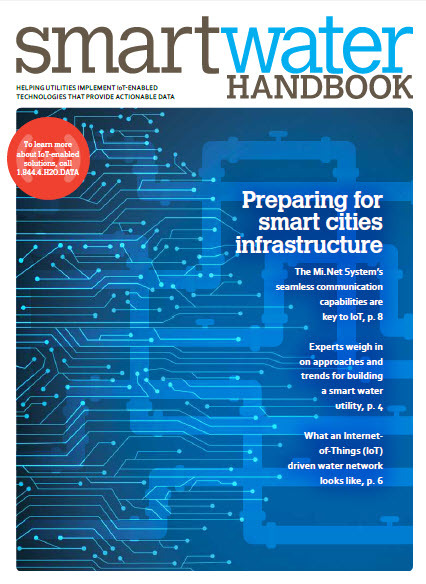 This publication, the Smart Water Handbook, is brought to you by Mueller Water Products, a single-source supplier for utilities bringing leading technologies to the industry on AMI, leak detection, remote shutoff, automated flushing, pressure management and more. Thanks to our partners and industry experts who shared their thoughts and insights on the following pages, we've defined what a smart water utility is and how smart technologies solve common challenges, as well as how utilities of any size can start implementing IoT technologies.